I'll just add again that I had an '83 Marshall G12T-75 cab with original speakers. So yes, they were certainly out well before '85. Funny enough, I preferred my '81 Marshall G12-65 cab (which I still have to this day), and sold off the '83 cab many moons ago. I don't put much stock in Monty Jay. It's just not a reliable source of info. Even Flemming has trouble recalling and wasn't fully aware of what they used at the time. Flemming has said they used EQF-1's on the album when clearly the studio picture was an EQF-2. The EQF-1 is also inconsistent with his notes since it doesn't have the same peaking/ shelving options that are listed on his notes that only the EQF-2 has. After a quick check I didn't even see the EQF on the Monty Jay site (only a Furman PEQ) and being that I own 2 EQF-2's myself these units are absolutely critical to the MoP tone receipe! Also pictured at sweet silence with "crunch berries" and therefore easily deduced was taken during the MoP session - separate Google search & NOT pictured on Flemming's site - are two compressor/ expanders along side the 2 EQF-2's which I also own and from experience I can tell are used to tighten up the crunch at those gain levels along with adding some punch. Settings are difficult to see but you can see that one is being used in compressor mode while the second is expanding. It makes no sense that these were used in series since one unit can perform both functions simultaneously. This technique would be consistent with two separate heads with one cab each, both being fed by what appears to be an ABY box(again explaining why there's 2 of everything) that his guitar is going into with 2 cables coming out, and not one head with two cabs being miced as some people speculate based on Flemming's notes. Oh, "maybe he used stereo for cleans and mono for distortion?".. you say? Nope, the picture squashes that theory since the lead channel knob is pulled. Flemming is doing one of three things, either he completely neglected to even notice a stereo rig right in front of his face(unlikely), or he lost, forgot to, or didn't take notes on the second amp settings, etc., or he is intentionally withholding the final ingredients to the "holy grail." ^That's not accurate. As I stated, I had a cab from late '83 with '83 date code G12T-75s in it. I recently had one with March '84 date codes as well. Marshall had no consistency in those days. The recent one had a 260W label on it too. Just like my '90s V30 cab still using leftover 300W labels. Marshall didn't get more consistent in their data or labeling until around the mid-'90s. If you had a cab from the early '80s, there's quite a handful of speakers it may have had stock, regardless of what the label said. could you please post pics and the serial code of your G12T-75, it's interesting ? 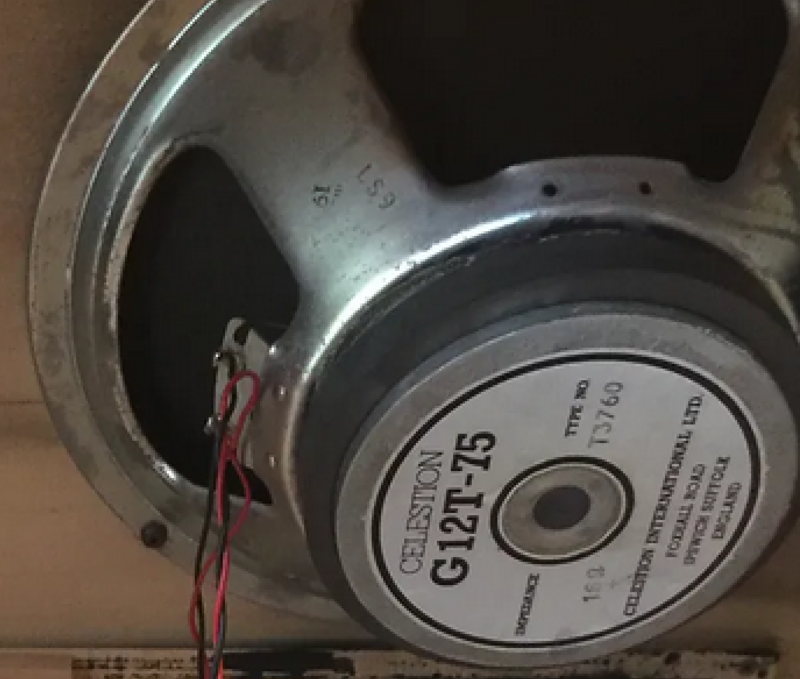 I had a 1984 G12-T75 speaker and it is by far the older one i've seen on the market. I wasn't aware of a 1983 G12T-75 speaker. How do you know it was the stock speaker ? I can hear that Marshall was inconsistent at that time. But for the old stock spares, not for new speakers. 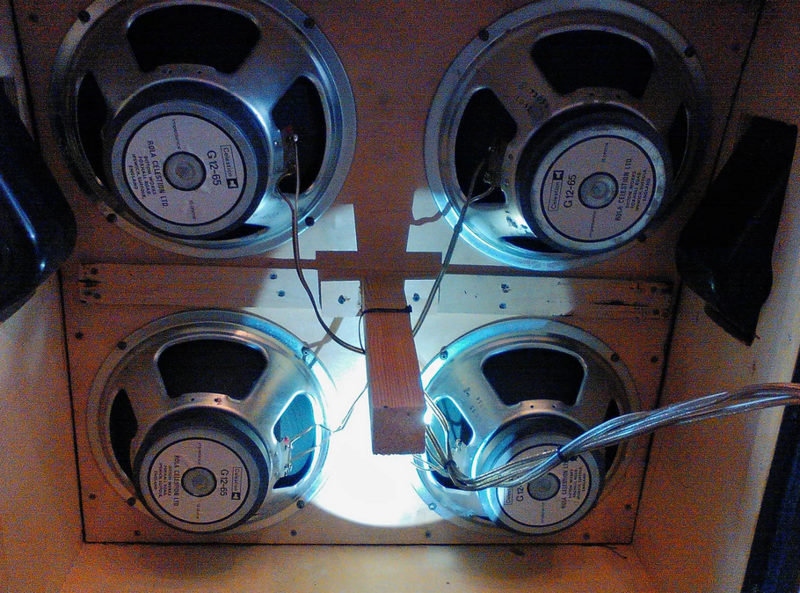 So what about a freshly new speakers, custom made by Celestion for Marshall especially to replace the G12T-75 ? At these time, Marshall was the number one seller, with massive sells each years. And Celestion don't delivers speaker unit by unit, they deliver a massiv batch of units. 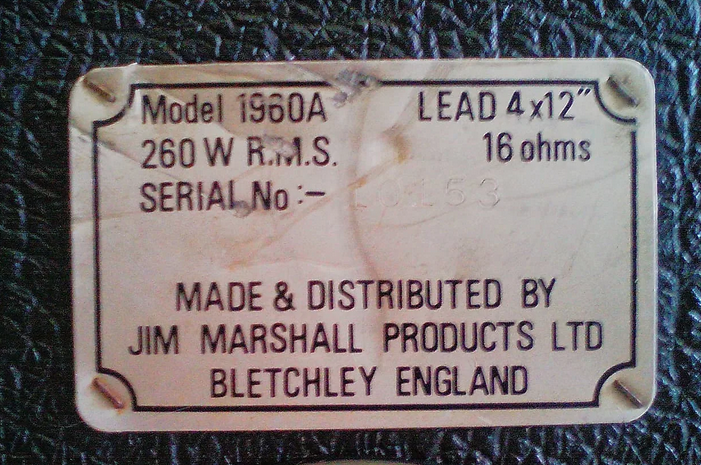 So to be realistic, it have to be built and produced massively to Marshall in 1984 then sold into the world. Also take in consideration that the brand to try news thing of sold old stock was Park, not Marshall. Anyway, ok, let's suppose it happen. Do you think the cab at sweet silence was freshly new cab ? And between the time Marshall produce the new 1960A/G12T75 speakers and send them to the brokers : you have a gap. Denmark isn't a big place for music, i don't think the news 1960A arrived before the end of 1986. I suppose sweet silence were probably more used old cab with the stocks speakers of these time : G12-65 or, older, Greenbacks. +1. The 75 is the only one that would match up with Flemming's "300 watt kabinets" notes. Which do people believe, evidence that matches old notes OR taking old forgetful dudes words as gospel who can't remember 5 mins ago? @boogieordie : there are no 300 watts produced in Marshall catalog at these time, it's cleadly stated in the books of reliable people. And the speaker next on the Marshall production list was the G12-70M, not the G12-75T. The last one, I was told it was stock from the original owner. He sold the stack, which he bought new, late '83 cab and early '84 2204 head. He'd never opened it up before. I have no reason to believe he was making up the story. They were both in exceptionally nice condition. I'll look to see if I have any pics of the old cabs/speakers, no promises on that though. I don't have any 75 cabs at the moment (sold them all). Sweet Silence had a mix of new and used cabs. They allegedly had up to a dozen cabs there at any given time and used whatever sounded best at that particular time. Here's something for you. MoP started recording in Sept '85. The cabs used were serial numbers in the 11k range. I've seen cabs in the 9k serial range dated to mid-'84 and 10k serial range with speakers dated to '85. That means the cabs used on MoP were pretty much brand new. With 75s dated to '83 and '84 and RTL being recorded in early '84, it's possible they were used on RTL. It's also possible a host of other speakers were in there. We'll never know with 100% certainty. But here's something to add intrigue to your story. The old 75s allegedly were made differently than the later '90s models. I've seen a frequency plot of G12-65s compared to early 75s, and they were nearly identical, as opposed to later 75s. So whether it was either of those speakers, there's a chance the tonal difference was minimal, rendering an either/or discussion almost moot... Assuming it wasn't another speaker entirely. So you choose to believe forgetful old people. Check roge. Nor do those notes exclusively say 300 watt cabs were only used for solos. 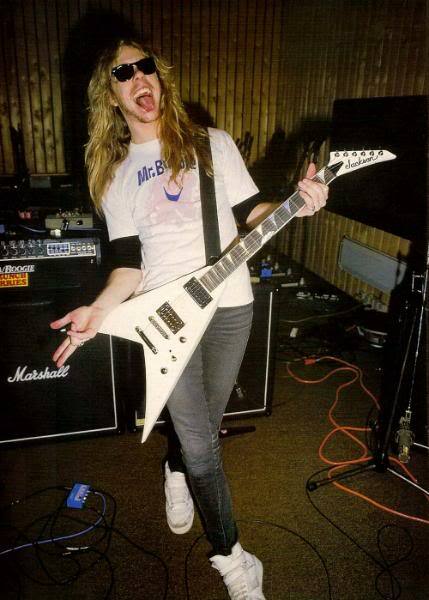 It may have also been for quick reference if he had forgot what all guitars ran through. 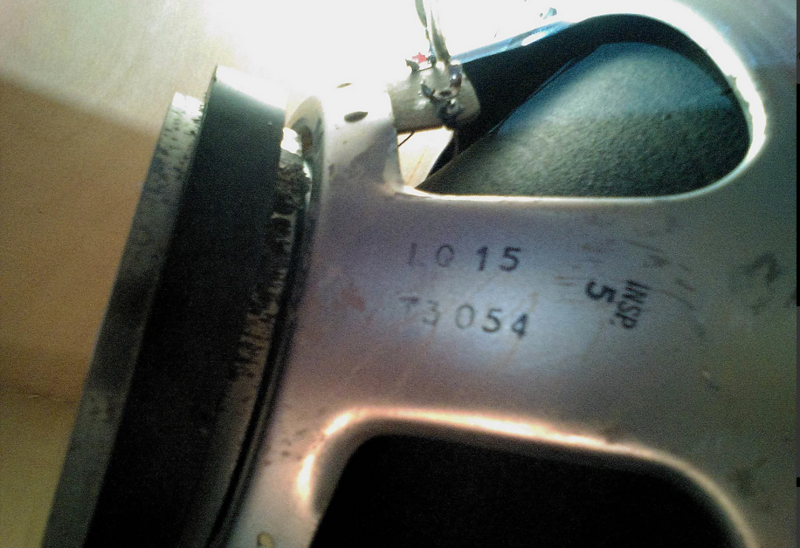 Serial numbers date back further than these old forgetful "reliable" sources claim. The math is easy on what to believe. It's a no brainer. After revising the flemming notes, it's correct, 300w cabinets were used for battery song at least (evidence below). I don't know if it's james or Kirk set but it means that it's not G12-65. I will dig for the original date of the G12-75 and the cab serial numbers. But i sound strange : Marshall would have sold only 2000 cabs between 1984 and 1985 ? My understanding is those two cabs (serials in the 11k range) were the only cabs used on MoP. I can't speak to how many cabs Marshall produced in a given year, but my point above was that serials in the mid-9k range dated to mid-'84, and I've seen a cab in the high 10k range dated to '85. 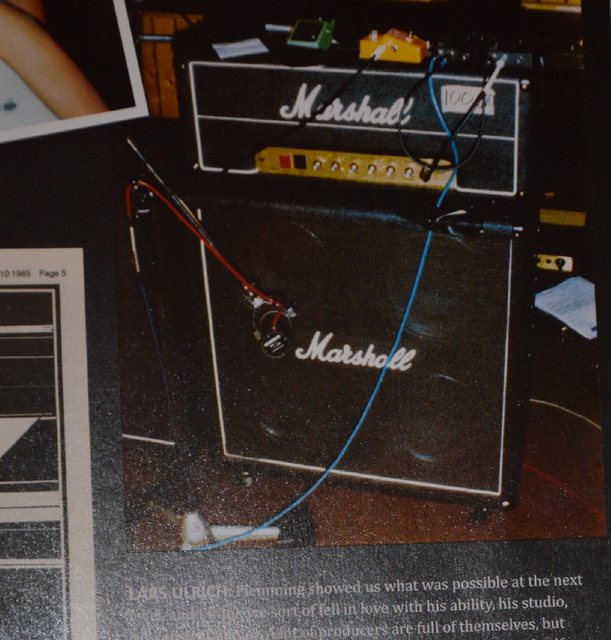 If MoP started recording in Sept '85 and those 11k serial cabs were already in the studio, they would have had to be close to brand new at that time and probably dated to a mid-'85 range, maybe early '85 if Marshall got out of whack with labeling (highly possible). 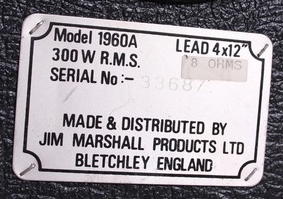 It also means that by early-to-mid '85, Marshall did have the 300W labels (clearly, as Flemming wrote it down). 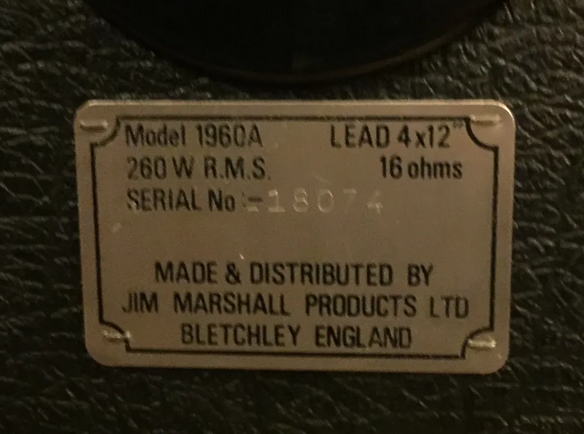 I do remember that one of the older 9k serial 75 cabs was using the 260W label, so it leads one to believe that Marshall used 75s in earlier cabs, but didn't consistently use proper 300W labels until the 9.5k - 11k serial range somewhere. Based on everything known, I'm about 99.9% certain that MoP was 75s. But, based on the frequency plots of the original 75s vs 65s (which looked relatively identical), it looks (at least on paper) like you can grab an old '80s cab with either and get close. RTL I can speculate, but I'm not as confident on what was in the cab. I feel like we can only assume on that one. LS9 = 9 November 1984. More, the cab serial number : 18074. A testimonial dating a similar cab rated at 260 watt with G12-T75 inside the 15 june 1985, serial 17605 (https://www.thegearpage.net/board/index ... ab.390936/). Another cab, serial 10153, really close to 11622 cab used by James. Speakers are all stocks G12-M65 made in 1982. So the 1960A 11739 used by james would surely have been builded before september 1985 and could have only been rated at 260 watts and not 300 watts. Now the big query : how did they know it was a 300 watts cab ??? A. Not a Marshall 1960A cab (the only other similar cab, the 1982, was rated at 320 watts with G12-80 (=Classic Lead=Mesa BS C90) a the same period. But the few serial number i found where really low, around 4000 only, i doubt a lot the 1960A was less popular than the 1982. The 1982 was after switched to G12h-100, rated at 400 watts speakers). B. This is a 260 watts cab MODIFIED by Flemmings itself, with G12T-75 (maybe the same while he was searching for james cab and amp for RTL) => But it sound strange : A pretty new speaker, made only for Marshall, why they would buy it specialy for master ? I presume there where even not commercially available at that time. D. Marshall have changed the speakers inside, but not the label. Flemming (or assistant) open up the cab and was aware of that, it's may explain why he note the serial number of the cab. End of the story. Last edited by dafxtone on Sat Feb 23, 2019 2:04 am, edited 3 times in total. The first picture of the JMP half stack was the setup used on RTL. The second pic with James and the two cabs is from the MoP sessions. Those are the cabs with serial numbers noted in Flemming's notes. All of the cabs you see are Marshall "B" cabs, not "A" cabs. I'm just speculating here, but A (slant) and B (straight) cabs may run on their own serial number timeline. All Marshall series before the '90s didn't have a single numbering system. For example, my '76 Marshall Greenback cab has a serial in the 4K range. My first year, '87 Marshall V30 cab has a serial in the 1k range. Considering some of those serials you noted were later dates (an 18k serial cab dating to '84 with appropriate 75s), I speculate that 1960A and 1960B cabs followed different serial number timelines. All cabs I've mentioned I had were 1960B cabs. My '81 1960B cab with 65s is a 5k serial number. That said, this would all make sense. 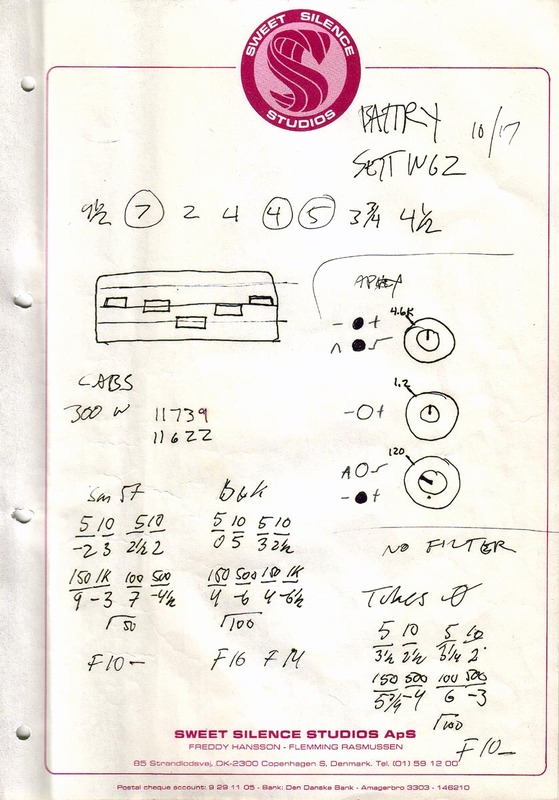 If by '84 they were hitting the 9k-10k serial range on B cabs with 75s and still using 260W labels, they were up to the 18k range on A cabs at the same time...also using 75s and 260W labels. It would also help explain why it seemed so few were produced in a one year span from '84 - '85...more actually were produced, they were just running on seperate serial timelines. By '85, we know they had started using 300W labels. I have no doubt Flemming just wrote the serial numbers and wattage from the serial plate.